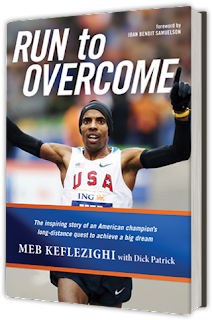 If you haven't heard about Meb Keflezighi and his recent book Run to Overcome it is something you will want to find out more about. I can't comment first hand on his book because I have not yet had the opportunity to read it yet, although it is at the top of my most wanted running books. This book has been the talk of running blogs lately which had made me stop by on a regular basis to the book's site to try and win an autographed copy without any luck yet. This giveaway will be a bit different than other giveaways I have done previously on this site. The entries for this giveaway will rely almost exclusively on my Facebook Fanpage. To win this book you must still "Like" my Fanpage on the day of the drawing. Like 26.2 Quest on Facebook. "Win Meb Keflezighi's Run to Overcome @262quest http://bit.ly/WinMebRuns via @virtual4now"
"Win Meb Keflezighi's book Run to Overcome from @26.2 Quest http://bit.ly/WinMebRuns"
Good luck! Time to get commenting. Comment often for the best chance to win! While you are here, why not follow me or my blog using the icons below!